Back in August Dino published a latching circuit made from BJTs over at his blog Hack A Week. In his video Dino made a comment or two on how the circuit was a little finicky and adding a capacitor from the +9 V rail to the output node seemed to help things though he didn’t understand why. I took an interest in the circuit and spent some time prototyping and refining the design. I did succeed in tweaking the circuit for the better but I never did figure out why Dino needed the extra cap in his build. During my tests I found no difference in performance by having the capacitor in place and so it’s labeled as an optional component in my schematics. 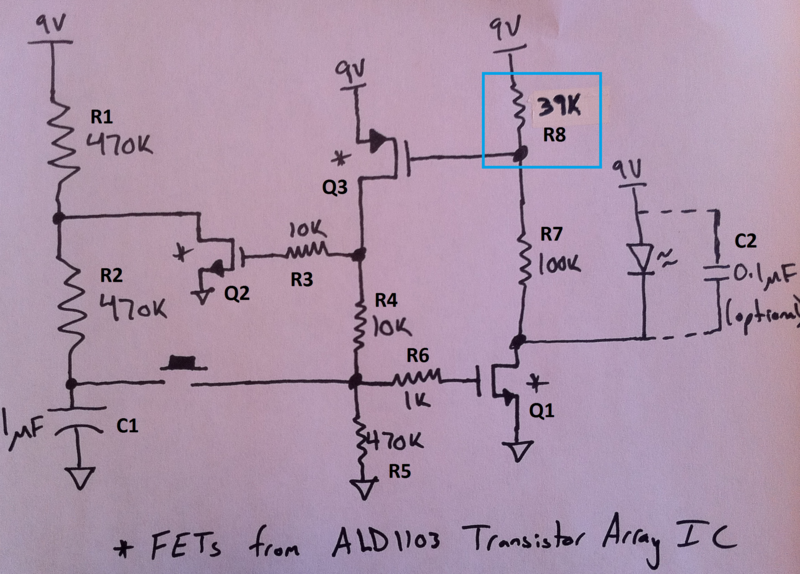 Read on for my analysis on the transistor latch. Figure 1 displays my initial attempt to copy Dino’s latch circuit; I didn’t have any BC547 or BC557 BJTs on hand when breadboarding the circuit so I turned to the ever popular 2N3904 and 2N3906 instead. Ignoring the two colored boxes for now let’s discuss how the circuit is supposed to operate. When power is first applied all three of the transistors are off and the LED on the output is unlit as both it’s anode and cathode are at 9V (Q2 being off causes the output at it’s collector to rise to 9V through the two pull up resistors). Capacitor C1 also begins to charge to 9V through the two 470kΩ resistors R1 and R2. Toggling the pushbutton switch momentarily causes the voltage across R5 to be equal to that of C1 which causes Q1 to turn on. Q1’s collector is then pulled low which pulls the base of Q3 low turning it on. The LED, with its cathode now close to ground, turns on. 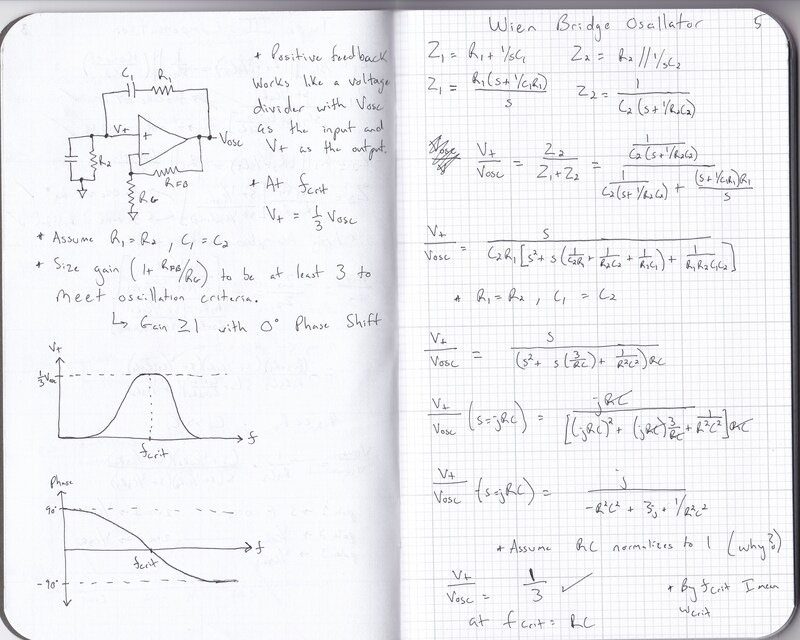 Q3’s collector is now close to the supply voltage turning on Q2. At this point the voltage at the R5-R6 node is high enough to keep Q1 turned on and the circuit “latches” keeping the LED on. With Q2 turned on, C1 discharges through R2 and eventually sits at 0V. Toggling the switch again pulls Q1’s base low turning it off and causing a domino effect around the loop, latching the circuit in the off state. My first impression upon studying this circuit was that closely resembled a bias network that I had seen in my IC design classes at school and so I went to my stack of books to refresh myself. Sure enough, in Chapter 4 of Gray and Meyer there were all sorts of circuits that were similar in form to the yellow boxed in section of Figure 1. 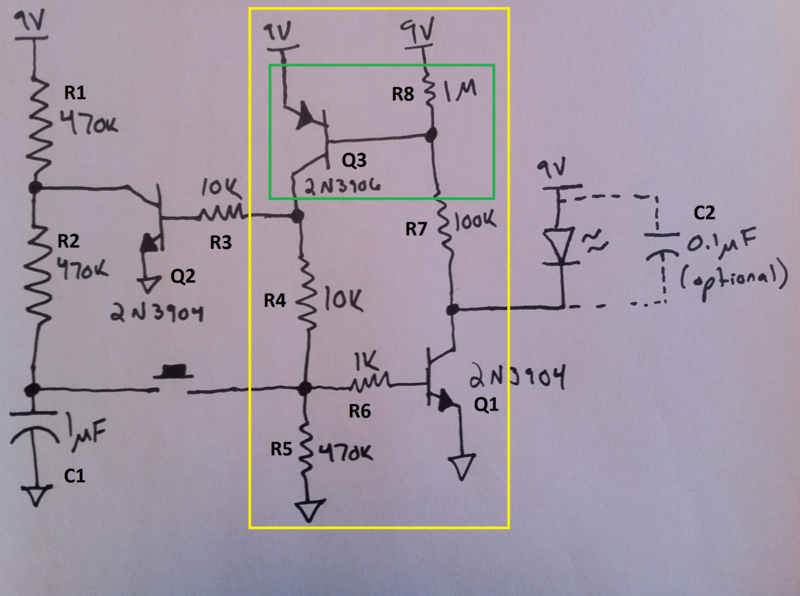 It was official, the yellow boxed in area is a form of bias network which would be used in IC design as a support circuit so to speak to develop a key voltage or current needed to bias a transistor along the signal path somewhere else on chip. Well this post has certainly turned into a much longer article than I expected it to. I haven’t even begun to talk about the actual results I got in hardware. I guess I have a lot to say about the intricacies of transistor circuits. Sorry, it’s kinda my thing. I realize that I kind of glossed over how positive feedback affects the bias loop but the actual analysis is rather in-depth, complicated, and involves a lot small signal analysis (I don’t know if I fully understand more than the basics of it myself either). Hopefully I’ve made my descriptions relatively clear, if not just let me know and I’ll attempt to fix them. I’ll discuss the hardware results in a new post to break things up a bit.